If you are one of us enthusiasts setting at least one resolution for the upcoming year, you are aware that you won’t probably stick to it for long unless you get a year membership in a gym, subscribe to Psychologies to find how to improve your relationships or visit Vinopolis and attend one of their “HOW TO TASTE WINE” guided tours to avoid next social faux pas when saying that you prefer white wines because all the reds are like drinking a tea from wood. Vinopolis is a vast premise located near to the London bridge where you can immerse yourself into a wine bottle or – less radically – you can learn a bit about the history of wine, wine varieties, principles and methods of wine making, taste some wines, and be guided through the simple procedure how to taste wine. All this in an amusing way in this “museum” of wine and spirits in London. You can purchase the tickets online or on the spot. There are variety of tickets available. The basic one includes tasting of 5 wines plus a cocktail at a Saphire cocktail bar inside the Vinopolis. The prices start at £19.50 out of peak. You can also buy extra coupons for “higher quality” wines. Fancy a wine with a chocolate or wine with cheese? Then you can attend some of their special wine events, where you learn how to pair wine and other skills. The drawback is that the events take place usually once a month so you need to book them in advance. We preferred a simple wine tasting tour. Shortly after you enter you can watch a number of movies about the history of wine and adore the ancient wine jugs exhibited there. You might be surprised when realising that already people in Mesopotamia were drinking wine and that Georgia is one of the oldest wine countries. Perhaps a good idea for your next vacations – tracing the history of wine in Georgia. Every 30 minutes there is a guided session with a wine expert explaining step by step the art of sniffing, smelling, tasting, whirling and also playing with wine in your mouth. You see, it isn’t so boring or soulless to really analyse the white, rose or red grape liquid in your mouth. This session teaches you enough so you are ready to explore the world of wine. Now to tasting itself. Start with a glass of bubbly at the Champagne bar then move to the first room where a new world wines are lined up waiting for you to decide which one gets the privilege being your first experiment at the Vinopolis. In the following rooms are more classical French, Italian and Spanish wines. The choice is very extensive so consult the wine with the assistants serving the wines as they know their stuff. Some of them will be really helpful the other might be less friendly and knowledgeable. Though, feel with them, perhaps they are just having a bad day, so move to the next one. If you prefer your wine with a nibble you can buy a tapas plate with olives, meats and cheeses in the tasting rooms or if yo are really hungry you can finish your wine tour with a lunch or a dinner at one of the restaurants inside the Vinopolis. Finally, if you liked some of the wines so much you can buy them in the shop placed just at the end of you tour though a labyrinth of Vinopolis. At the Vinopolis you can also explore the mouth burning Absinthe, rum, whiskies and also a beer from their own brewery. An IMPORTANT advice by at the end: Don’t try the Thai wine they offer in their unusual wine section. It is really so bad. I had to drink two cocktails instead of one to fix my palate. The Bombay Sapphire Blue Room and selected tasting tables will close 30 minutes prior to the rest of the tour. For those of you who have a solid base knowledge about wine and want to extend it you can attend one of the special classes called Tom’s wine school hosted by the wine expert Tom Forrest once a month. High quality wine by the glass? Usually, you would have to visit one of the top gourmet wine restaurants or bars where you would pay a fortune for them. Not in Vienna. Traditional Heurigen are a blessing for wine lovers visiting the Austrian capital as well as for locals. These legendary wine shops, which are sometimes also wine bars, with a traditional Austrian ambiance are run by Viennese wine growers. You can get a very nice glass of Grüner Veltliner for as little as 1,50 € or a tasting session of six varieties from 7 €. Compared to the Middle Ages when the wines sprawled out right into the centre of the town, today you must head to the outskirts. In the North you find fine Riesling, Chardonnay and Weissburgunder (Pinot Blanc) pampered by the limestone soil. The most popular and also more touristy area there is Grinzing. If you want to escape the crowd then head to the South. 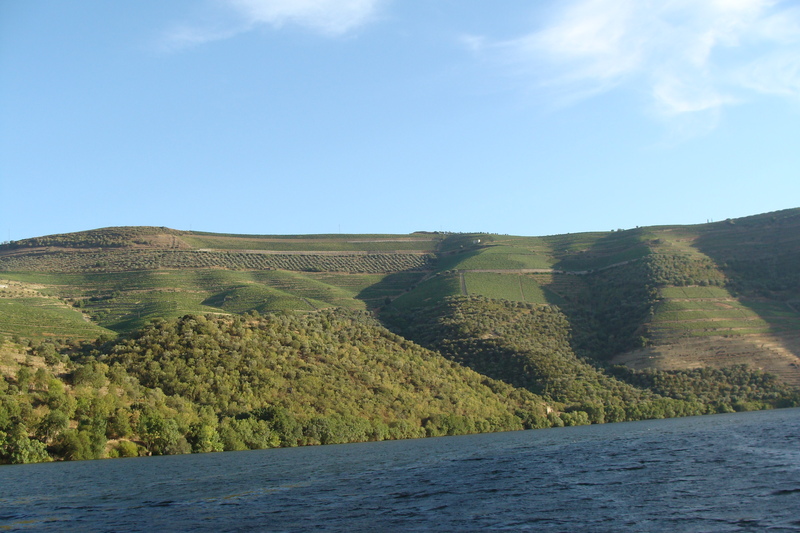 Black earth soils favour strong white wines and opulent red cuvées (blends). In a bone-chilling December I couldn’t explore any of the open vineries, so popular during the summer as you can enjoy wines outdoors with a spectacular view on Vienna. During the winter you have to look for places with their own warm premises where you can taste the whole evening and in some even get a bite to eat. I’ve visited Steinklammer, located in the Southern area of Mauer. 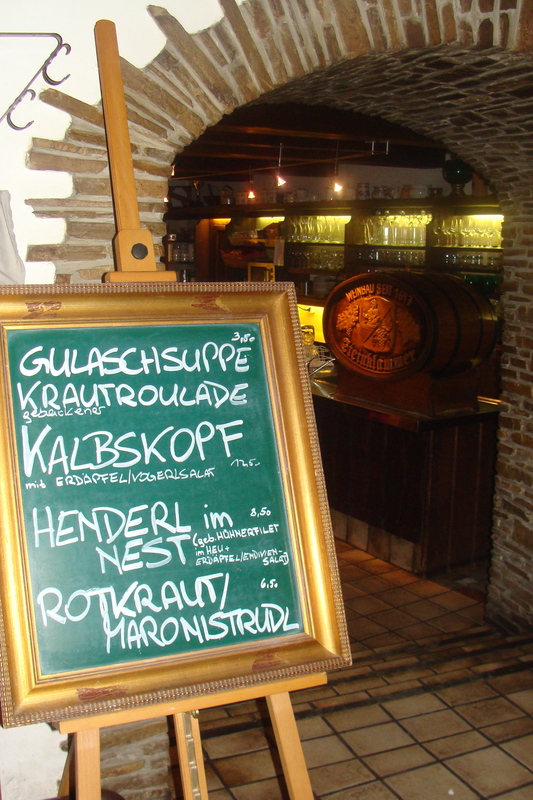 This Heuriger has over 310 years of tradition and their staff is very helpful. Their lovely wooden inn was perfect for an icy evening. Starting with a glass of white Grüner Veltliner, high in acidity and tasting like a ripe green pear, I was a bit disappointed as it was perhaps too young for me. Nevertheless, I moved to a Riesling, Reisberg, 2008 smelling like elder flower , which with its balanced and refreshing citrus aroma enticed me to taste more. I moved to reds and went for a tasting of six varieties for 9€. They were served on a long wooden tray with six fitted cuts for glasses. The most interesting was Cabernet Franc 2002. Sweet at the beginning reminding me a black currant juice and later moving to deeper tones of casis. Similar to this was Cabernet Sauvignon 2006 as it was quite fruity as well, but more distinct tannins in the mouth. Cuvée Titan 2005 was a blend of Pinot Noir, Merlot, Cabernet Sauvignon and Cabernet Franc. Its unique taste of raisins and griotte was a pearl in a shell. Now I could happily leave this cosy Heuriger lucky enough to have a friend to take me home in her car. No way I would be able to drive after such a feast! Still I was far from tasting all. In Vienna you can explore a wide variety of the typical “Gemischter Satz”, which is a wine made from different grape varieties planted next to each other and even harvested together. Viennese are not afraid to experiment, but not on the account of the quality. Their wines will surprise you. I bet, that most of you will know mostly the white Austrian wines as they make for 70% of the total production. That said the remaining 30% of reds are worth trial, at least for me they were a pleasant surprise. Let me know if I am wrong. Look at the list of Heurigen in Vienna at Weinausostereich and some facts about viticulture in Austria. Wonderful stuff you find at YouTube! Though I must add that she wasn’t drinking real wine because of her age. What a creative parents she has! This video triggers a question. What age should be made legal for drinking wine? Do you thing it should be different in every country as for example in France or in Italy wine is part of a family dinner? It has been often claimed that children often don’t like wine as the taste for it develops with age. Isn’t it a kind of a natural protection against premature drinking? Restaurant Festival at London’s Excel from 4 to 6 December will be full of top chef celebrities such as Heston Blumenthal of the world’s best awarded restaurant Fat Duck. Your taste butts will be indulged, that is guaranteed. Though, many of you don’t know that with all that amazing food you can also taste some wine with Buongusto.They will have a stand there with plenty of wines to taste. You can still get the tickets online or if you want to risk it on the spot. 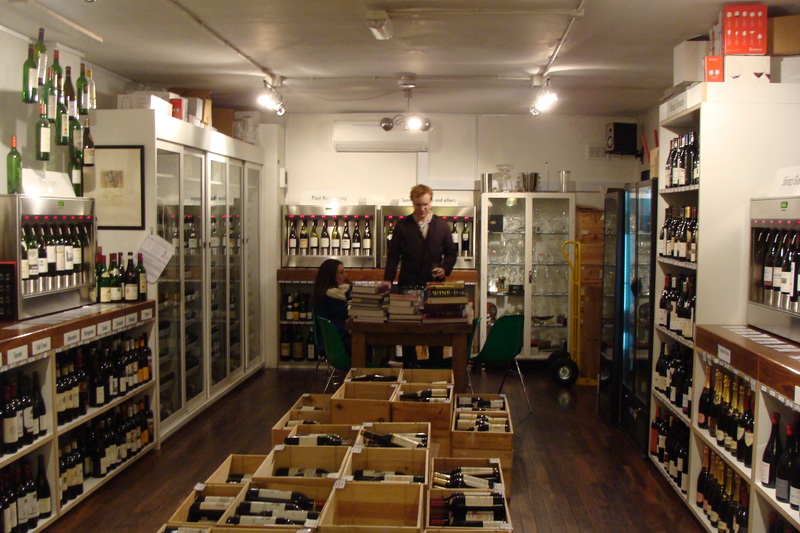 A co-owner of a popular wine shop in Islington Jamie Hutchinson isn’t just another wine seller. When he and his partner Dawn Mannis finally opened The Sampler in December 2006 after long planning they set out to be an independent shop. Jamie sees it as a key to stay unbiased. Being free from any commercialised restrictions from a big chain is the main reason for an unprecedented success of this small wine shop. Jamie said: “For us it is important not to be brand centric and be quality driven as well as offering good personalised service.” Not like many commercial merchants who should be more interested in wines and have a more personal approach to their customers. The individual approach was rewarded by winning the Decanter Readers Choice Small Wine Merchant of the Year 2009 and many other awards. Although Jamie treasures the readers choice the most as they are his customers. Want a sip of Chateau la Tour? 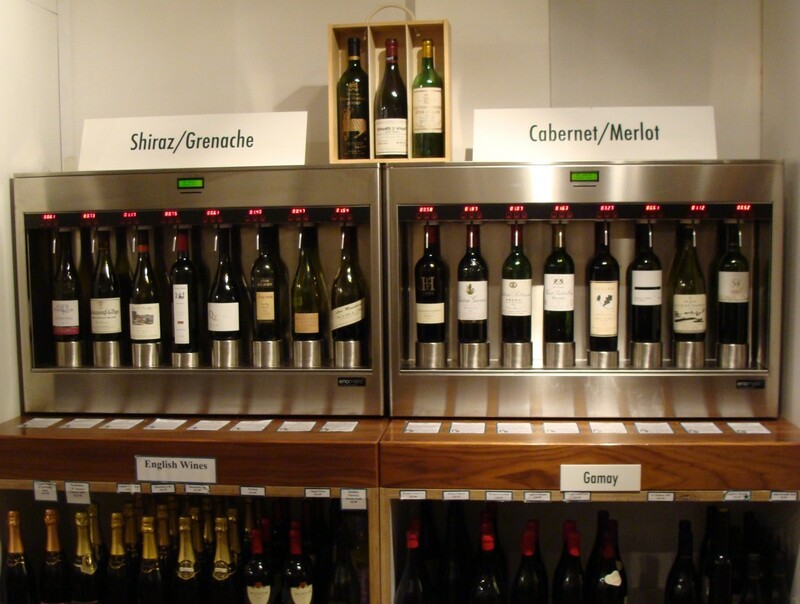 That is why the shop is equipped with the Enomatic wine dispensers enabling sampling of smaller amounts of variety of wines. There are 80 dispensers and wines are being changed regularly so you will never get bored by The Sampler. This system originated in Italy where Jamie had seen it for the first time while visiting the Tuscan village Greve in Chianti. You may ponder about how the wines stay fresh and do not oxidise after opening. The smart Enomatic system solves this problem as it keeps wines under nitrogenium environment preserving them for up to three weeks from oxidation. So you can get to taste such treasures like Chateau La Tour. The most expensive bottle The Sampler has ever put to taste cost £1500 and Jamie nods that it was not a £15 per sip deal. How sampling actually works? 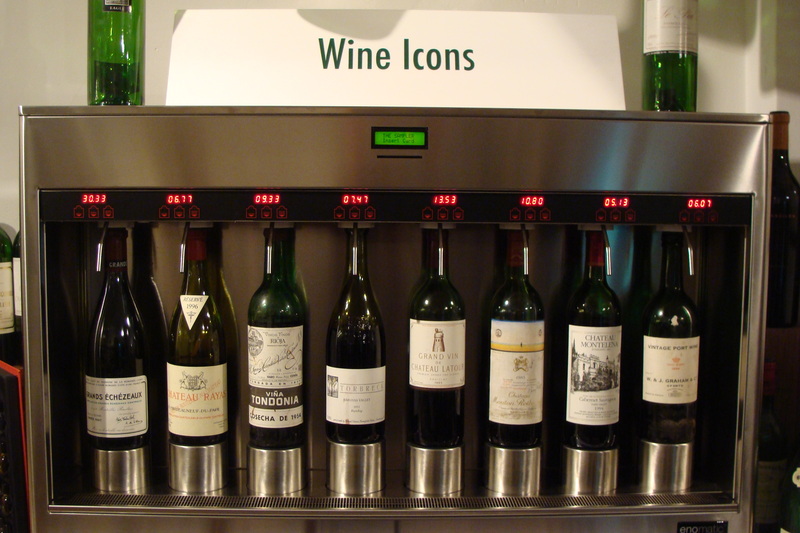 You buy a prepaid card and then just stick it into the reader on the dispenser with the wine you wish to taste, and then just pour the wine into a glass provided in the shop. Easy. You can spend as little as 30p but you can get to £100 if you want to get something special. Furthermore, if you want to taste more you can choose the multiple dispensation and assure yourself that this is really the wine you want to buy. Getting back on Earth from our daydreaming we discussed today’s trends in Britain. Jamie sees significant potential in sparkling wines in the British wine industry. With global temperatures rising some areas such as Rioja in Spain will benefit and Jamie recognises the similarity between the Champagne region in France and Southern UK. Read more on English sparkling wine. Charity became also part of The Sampler. 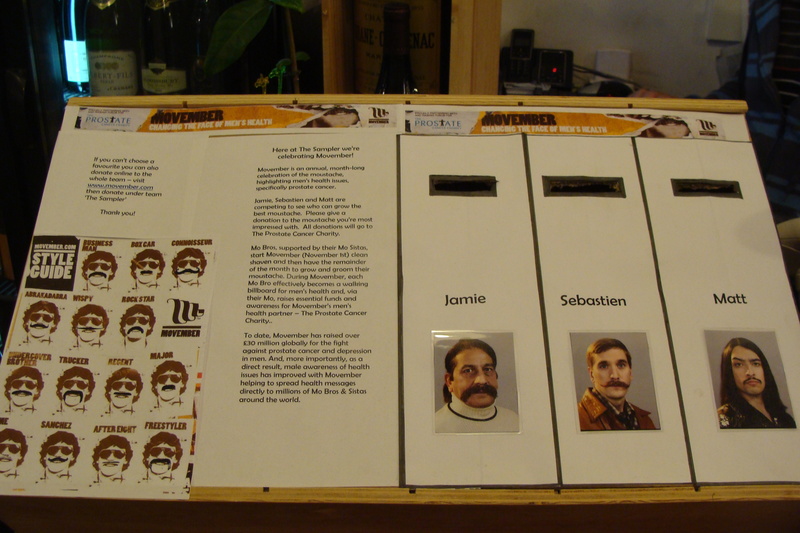 Movember, a charitable organisation helping men with prostate problems, touched hearts of the team as they appeal to their customers to contribute to a good cause. You can not only sample and buy wine plus get professional advice at The Sampler but also you can attend one of their tasting events. The earliest one takes place this Sunday from 1- 6pm and is in the spirit of Christmas. Jamie disclosed to me the wine selection and I must just add you should not miss it. Although I won’t tell you what you will taste as it is good to be surprised sometimes. 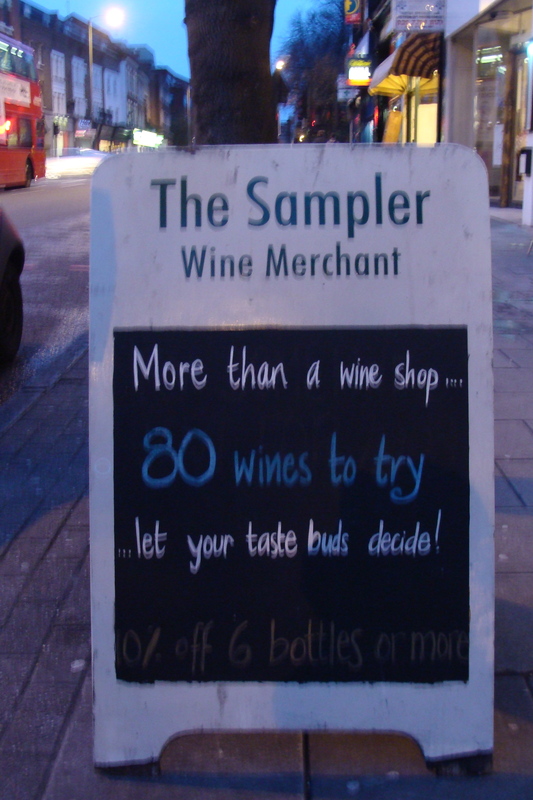 The Sampler is located on 266 Upper Street in Islington, London and is open daily. Last weekend the elegant premisses of the Landmark Hotel in Marylebone were swarming with wine lovers from all over the world. 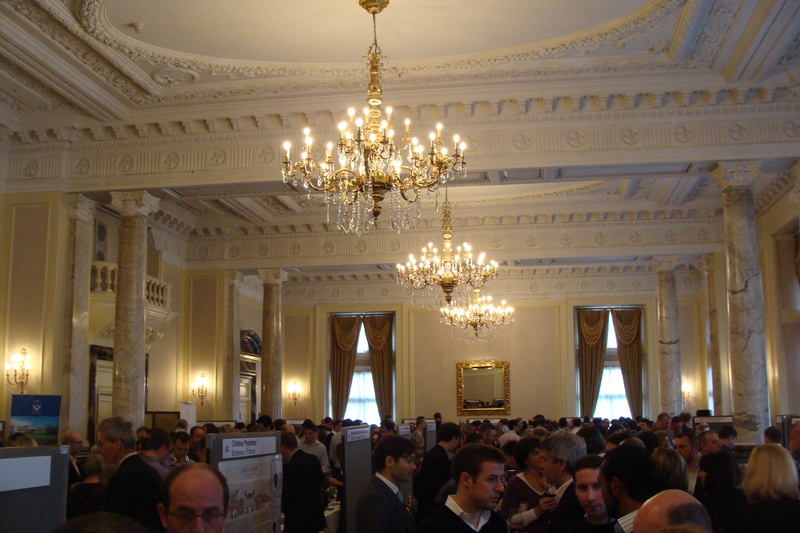 A young banker from South Korea indulging in the 20th glass of Bordeaux was not a rarity and a curious wine junkie from the Czech Republic (me) could not miss this magnificent event annually organised by the UK wine magazine Decanter. From over 600 wines I managed to taste 40 and even left with three bottles as a gift from the lovely representatives of Chateau Peyrabon in Bordeaux. I tasted their wines right at the beginning of my long journey through wine regions of the world. Particularly Chateau Peyrabon 2003 with its black currant and mature taste for such a young age surprised me. There were many other Bordeaux such as Chateau Beychevelle, Faugéres, Chauvin or the star Chateau Palmer which reshaped my conviction, that Bordeaux younger than 10 years is almost undrinkable. Their 2003 and even 2005 releases were more than pleasant! 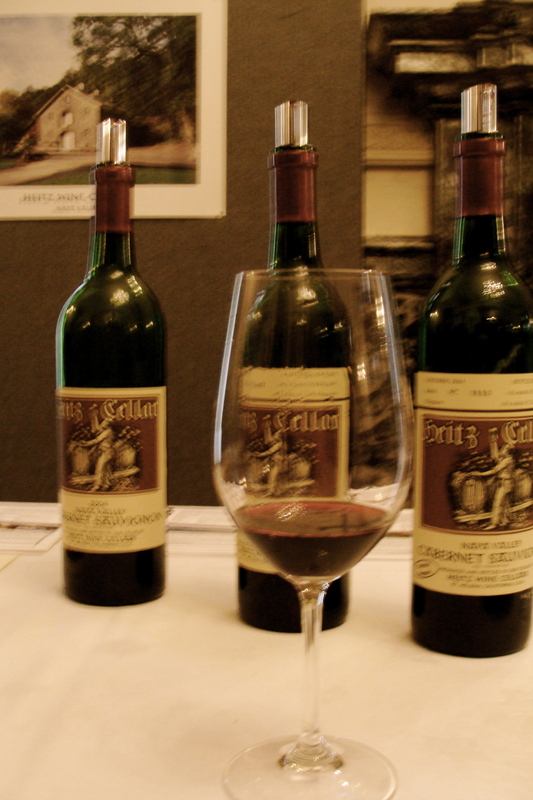 Another revelation was Napa Valley’s Heitz Cellars with stunning Cabernet Sauvignon, 2004 is perfect for your juicy steak. California really does not stay behind. You only need to search in the immense haystack of for me often boring wines and you discover such treasures like Seghesio’s Zinfandel from Home Ranch Alexander Valley which balanced body with light chocolate entangling your tongue was intriguing. From the eight winemakers from South Africa I would elevate the Danie de Wet Cape Muscadet 2007 for its exotic li-chi and orange peel flavours are ideal to accompany a peach sorbet. The Decanter Gold medal winner Steytler Pinotage 2006 and Steytler Vision 2006 were fruity and quite sweet. Both are from the Kaapzicht Estate meaning “cap view” as it stems from the wonderful view over Cape Town and Table Mountain. Finally a small revelation. Fashion designers have already made their steps into furniture, hotels, etc. But Roberto Cavalli triumphs over them all as he lets his son Tommaso manage a vineyard on his Tuscan estate Tenuta degli Dei producing Igt wine since 2006. You could buy the classic bottle for £32 at the venue or get a special limited version bottle designed by Roberto himself. 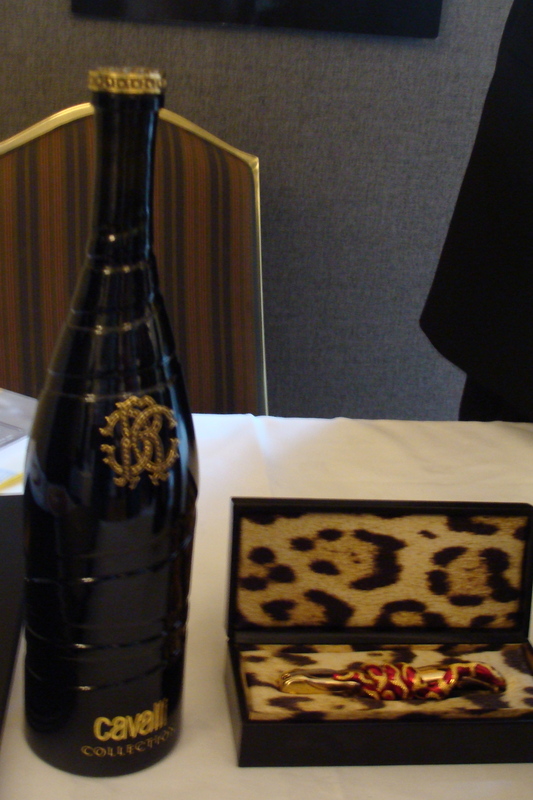 This year’s Fine Wine Encounter was amusing and enriching for me as I have learned there a lot. Furthermore, I could not resist to the special subscription offer from the Decanter magazine and got one year for £29 with a gift in the form of an internationally praised wine guide the Wine Report 2009 by Tom Stevenson (£9.99 at http://www.dk.com ). Throughout the event you could enter a draw and win a place at the WSET level 2 Intermediate Certificate in Wines & Spirits worth £355 from the largest global provider of qualifications in wines & spirits the Wine & Education Trust. What more to wish for Christmas as with their 40 years experience in the wine education your knowledge of wines can move to higher spheres. And this is not all! You could win cases of award-winning wines from Decanter and even a two-night luxury break at one of 17 historic country houses from Handpicked Hotels. Incredible! He is drinking wine like a tequila! I do not advice you to do it, otherwise you will end up with a terrible hangover despite the fact you were drinking Chateau La Tour, 1982 of an excellent quality!